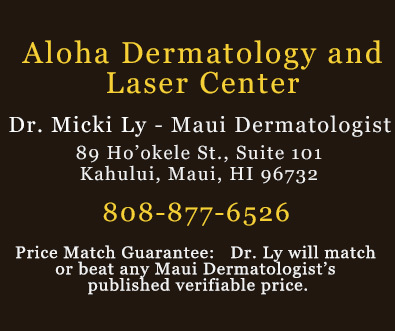 Dysport® on Maui from Maui Dermatologist - Micki Ly M.D. New Prescription Dysport® is an injection used to temporarily improve the look of moderate to severe frown lines between the eyebrows (glabellar lines) in adults less then 65 years of age. Individual results may vary. Dysport has been used for aesthetic treatments in 34 countries. In the United States the safety of Dysport for the treatment of frown lines was studied in more than 2400 patients. Here is a video clip of Dr. Micki Ly, Board Certified Dermatologist, and Dr. T, Board Certified in OB/GYN, discussing the use of botulinum toxin products Dysport and Botox, which are safe and approved by the FDA, to temporarily treat vertical lines (elevens) between the brows, Santa Claus smile lines, and horizontal frown lines above the eyebrows. This clip also shows Dr. Ly expertly administering Botox to remove Dr. T.'s elevens and horizontal frown lines. Dysport treatment lasts about four months and after this time further courses of treatment may be necessary. Discuss with Doctor Ly if Dysport is right for you. Dysport is a Prescription Medicine containing 500 units of Clostridium botulinum Type A toxinhaemagglutinin complex for injection. It is used for the treatment of severe frown lines. It should be administered only by trained medical professionals. Talk to Doctor Ly about the benefits/risks of this procedure in cosmetic medicine.